Our highly trained team of professional Underwriters, Account Managers and Underwriting Assistants are committed to providing stellar customer service. Visit the sections below to learn more about how to use our Agent Portal and Online Rater to obtain quotes, request applications, binding or endorsements, submit claims, and more. If you can’t find the answer here, please contact our Account Managers directly at info@ssiuw.com or 251.923.4474 anytime for assistance. Use the Online Rater to submit risk data and receive an instant quote. Or, enter the risk data and use the “Submit to Underwriter” button at the top right of the quote. To submit manually, complete our downloadable QQF (Quick Quote Form) for expedited submission. All requests will receive a response within the business day (submissions received by 2 pm CT will receive same day response). Reach the SSIU Underwriting team anytime via email at submissions@ssiuw.com or phone 251.923.4474. To request applications manually from our processing team, email applications@ssiuw.com. Digital signatures are accepted. Completed applications should be sent to binder@ssiuw.com. Completed applications packets should be submitted to binder@ssiuw.com for processing. Bind requests submitted through our Online Rater will be automatically submitted to processing and a confirmation email sent to the requesting agent. If using our Online Rater’s electronic signature feature, an email with the applications will be sent to the insured, then to the agent for signing. Once completed, a copy is automatically delivered to the SSIU processing team (the agent and insured will receive a confirmation email). Reach our Policy Processing Team anytime via email at binder@ssiuw.com or phone 251.923.4474. Access our Agent Portal to view your agency’s policies and submit endorsement requests. Coverage changes will be reviewed and quoted by an Underwriter, and premium changes provided to the agent prior to binding the endorsement. Non-monied endorsement requests (name changes, mortgagee changes, etc.) are processed in the same business day. General Change Endorsement and endorsed Declarations Page will be returned to the requesting agent via email. Contact our Policy Processing Team anytime via email at endorse@ssiuw.com or phone 251.923.4474. Properties are inspected within 30 days of effective date and annually at renewal (Exception – Builders Risk and HO6 risks are exempt from inspection requirement). New risks are fully inspected – including exterior and interior for replacement cost estimates of finishes. Attic access is also requested to gather details of roof decking/nailing patterns. Contact information for insured or representative for inspection scheduling required at time of binding. Inspection fees are non-refundable if policy is canceled after the effective date or if the inspection has been completed. If underwriting concerns are discovered during inspection, Agent will receive a notification letter with instructions for repair/resolution. Properties which do not comply with inspection resolution requests will be subject to endorsement, cancellation or non-renewal at Underwriter discretion. Inspections reports are available for review and download via our Agent Portal in the Policy tab under Policy Details > Documents. Inspections are performed to verify building characteristics and identify any underwriting concerns which may be present. They are not meant to dictate coverage amounts, but will verify replacement cost coverage. Risks which have an ITV of less than 80% of Coverage A as determined by the Replacement Cost Estimator used during inspection will be brought to attention of the Agent. MSB or other RCE may be requested to verify replacement cost. Replacement Cost Estimators vary. Note that not all RCE programs gather data which include the same information or guidelines used by SSIU’s inspection company. Lumber pricing, inflation costs, debris removal and other factors can all influence the replacement cost evaluation. Presence of shutters will be verified during inspection. If during inspection, presence of shutters cannot be verified, the policy will be endorsed to remove the credit. Questions about an inspection? Contact our Inspections Team anytime via email at inspections@ssiuw.com or phone 251.923.4474. Claims may be reported via our Agent Portal under the Submit FNOL/Claim tab or via email to claims@ssiuw.com. We ask agents to educate the insured on loss mitigation and encourage them to begin the clean-up process as soon as possible to prevent further damage. Billing for New Business and Commercial accounts is the responsibility of the Agency. 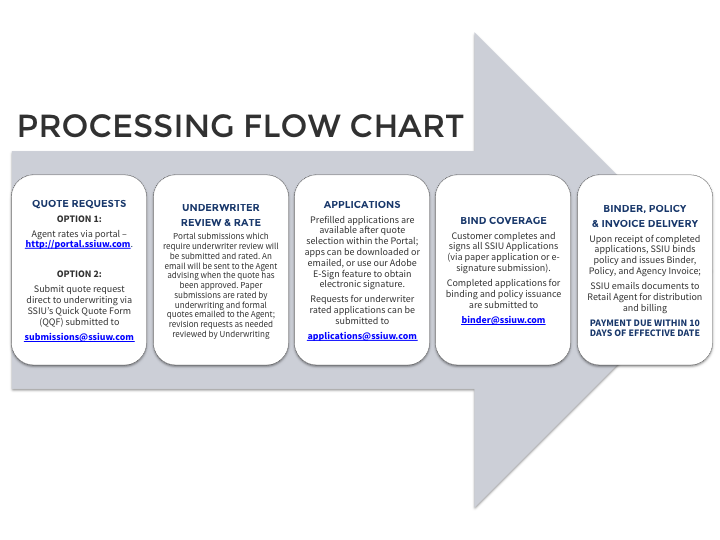 Net invoices are submitted at time of binding to the Producing Agent for payment, and all invoices are due within 10 days of the effective date of the policy or endorsement. Access to specific policy invoice(s) and payment history is available within our Agent Portal via the Policy tab under Policy Details > Invoices & Payments. Direct Billing for Personal Lines Renewals is also available. Click here to learn more about our Direct Billing for Renewals Program. Please contact our Direct Bill Coordinator, Maria Byrnes (maria@ssiuw.com / 251.923.4483) to request direct billing for your agency’s renewals. Premiums not paid within 10 days of effective date will be scheduled for cancellation due to non-payment of premium. Questions about invoices or payments? Contact our Accounting Team anytime at accounting@ssiuw.com or by phone at 251.923.4474.